Is this perfect timing, or what? If you have had it with hideous old men behaving badly, it’s time to pay attention to some beautiful young women behaving, almost without exception, well. The conclusion of the 2017 Miss Universe pageant is less than four days away. The finale will be Sunday on Fox, live from Planet Hollywood in Las Vegas. If I am reading the pageant site’s countdown clock correctly, the show will begin around noon. I suppose that is because the Miss Universe pageant, like Hollywood movies, is no longer produced primarily for an American audience. You would think anyone who runs a pageant would understand the importance of photos of the contestants, but no: the would-be critic has to scour other sources. This never would have happened if Donald J. Trump were still in charge! 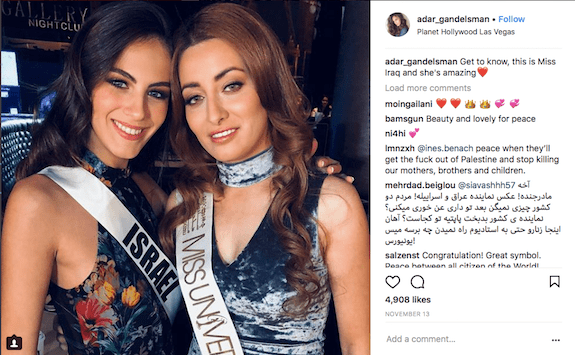 Beauty queens Sarah Idan and Adar Gandelsman are representing their respective countries at the Miss Universe pageant in Las Vegas, but Iraq’s Idan probably was not betting on the backlash to her Instagram post. “This picture doesn’t mean I support the Israeli government or its polices toward Arab countries. I apologize to everyone who saw it as an insult to the Palestinian cause — this was not its purpose,” Idan said in a response in Arabic. “She asked for a photo and I agreed, saying that I too hoped for peace and wanted to help pass on the message,” added Idan, who said she had served with both the US and Iraqi armies. Idan, a Muslim, was born and raised in Baghdad. Following the US-led invasion in 2003, she worked with the American military from 2008. She later moved to the United States and got a degree in Los Angeles. There is nothing new about any of this. The same thing happened in 2015 when Miss Israel and Miss Lebanon were photographed together, to the outrage of supporters of “Palestine” who demanded that she resign. Bigotry never takes a holiday, apparently. So let’s get on with it. Betting odds have taken shape, which identifies some contestants we can focus on. Be forewarned, though: the odds vary from one bookmaker to another, and residents of some countries are prone to betting heavily on their contestant, thereby unrealistically influencing the odds. Over the next day or so I will identify some personal favorites and do a follow-up post.